Yes! This Is Really Is The Gift You Don't Need To Wrap... but EVEN BETTER... because it's PERSONALISED! This, although I do say so myself, is simply genius. 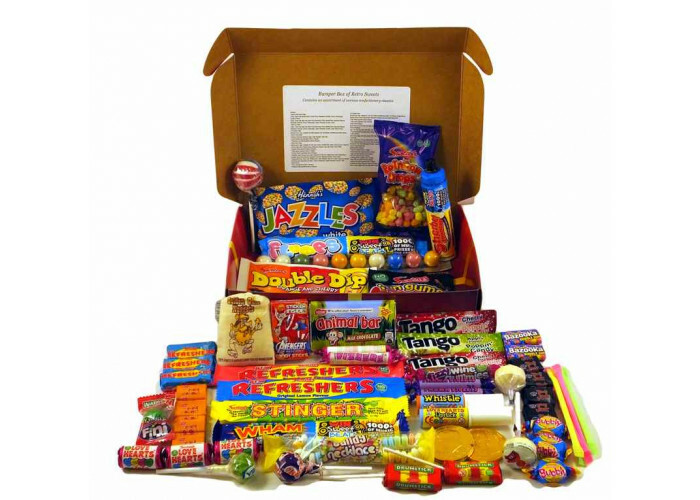 It's a quality box, jam packed with iconic retro sweets. And the box is designed to look like it's already gift wrapped. So you don't have to wrap it if you dont want to - you can give it as it is! We shrink wrap the box to hold it tightly closed... and to stop any nosey recipients trying to see what's inside before the big day! Take a look at the pictures to see just how many sweets we've managed to pack in. Plus there aren't any cheap fillers in there as you can see... just top quality classic retro sweets like Sherbet Fountains, Wham Bars, Popping Candy (aka Space Dust)... and even a sack of Gold Nugget Bubblegum!